HOW DO I CLEAN MY DOBOK? Your Dobok should always be clean and ironed and ready for each time you enter the Dojang. If it is not it shows as a sign of disrespect towards your instructors and fellow students (and poor hygiene!). 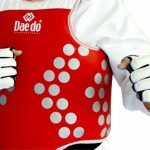 For best results (may vary depending on brand) you should wash your Dobok in a washing machine at around 30°C – 40°C and then it must be IRONED, folded or put on a hanger. THIS NEEDS TO BE DONE AFTER EVERY LESSON AS YOU CAN SWEAT A LOT! And so when you are getting ready for class you can just fold your Dobok up easily and put it in your bag /put it on. HOW DO I CLEAN MY SPARRING EQUIPMENT? Like your Dobok, your sparring gear needs to be kept clean. Not only is this for good hygiene, but it also keeps the equipment in good condition. Wipe down every part of your equipment with a sponge and soapy water. Avoid using bleach or corrosive ingredients. Then it should be left out to dry (NOT in the sun or on a heater as that can weaken parts of the equipment). This should be done after EVERY time you use the equipment. Then once every other month of more frequently depending on amount of use you can put your equipment in the washing machine (all except body protector and mouth guard) at no higher than 30°C. DO NOT TUMBLE DRY. We do not accept any responsibility for any damage done in the washing machine. Do it at your own risk. We have not had any issues before.